In the Western world, lymphoma is the 6th most common malignancy which accounts for 4.8% of all malignancies. Lymphomas are treated with chemotherapy, immune-chemotherapy, or radiation therapy, either as monotherapy or as combined modality treatment. In current practice,18 F-FlouroDeoxyglucose positron-emission tomography/computed tomography (18 FDG PET/CT) is considered as the standard of care due to its high diagnostic accuracy in staging and response evaluation at the end of treatment (ePET). 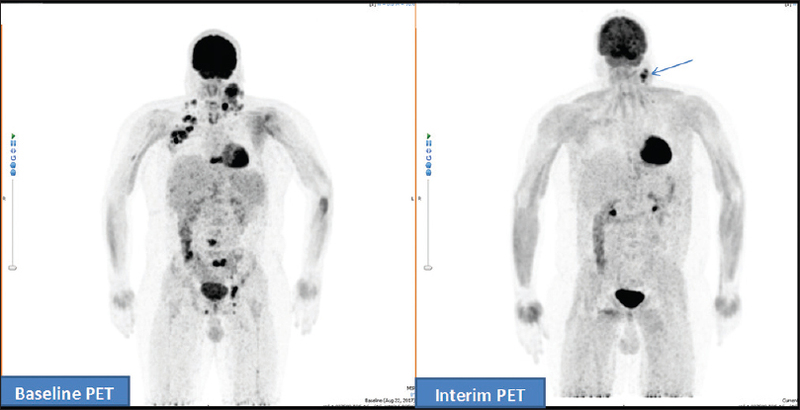 Interim PET/CT (iPET) performed during chemotherapy is being widely investigated in Hodgkin's lymphoma (HL), diffuse large B-Cell lymphomas, and other subsets of non-HL (NHL) for response-adapted therapy. However, results are quite variable as a negative iPET has high negative predictive value (>80%) but a positive iPET has significantly low positive predictive value (around 15%) for progression-free survival (PFS). This is because iPET cannot discriminate between the presence of residual viable neoplastic tissue and a nonspecific inflammatory host response., This heterogeneity is caused by adjustable and nonmodifiable factors seen in patient population of published studies. Adjustable factors include age and gender (significantly different age groups with gender predominance), nonstandardized imaging protocols, and interpretation criteria used in different studies. Nonmodifiable factors include tumor behavior and presence of microenvironment cells such as CD8+ tumor-infiltrating lymphocytes and PD1-positive lymphocytes. Hence, it is imperative to conduct studies on patients' population with minimal impact of above-mentioned adjustable factors. The purpose of this study was to determine metabolic response predictor(s) in propensity-matched patients having lymphomas who had baseline and interim18 FDG PET/CT using a standardized imaging and interpretation protocols. This prospective study was conducted at PET/CT Section of Department of Radiology, Aga Khan University Hospital Karachi, Pakistan from July 2017 to February 2018. We included patients with biopsy-proven lymphomas which were referred for18 FDG PET/CT studies at baseline and midtreatment scan performed not earlier than 2nd or later than 4th chemotherapy (iPET) for response evaluation. We strictly followed a standardized protocol for18 FDG PET/CT as per European Association of Nuclear Medicine (EANM) guidelines for both studies. Response evaluation was assessed on visual assessment using Deauville's 5-point scoring system and patients with Score 1–3 were considered as responders (complete metabolic response) while those with Scores 4 and 5 as nonresponders (partial metabolic response). 18 FDG PET/CT was performed as per the institutional protocol adopted from EANM guidelines. All patients had 4–6 h fasting (only plain water was allowed) and a fasting blood sugar <200 mg% before receiving an intravenous18 FDG dose of 3 MBq/Kg in the uptake room. During uptake period, (55–75 min) patients were requested to lie comfortably and allowed to take about 500–1000 ml of plain water. Bladder was emptied before call the patient for PET/CT imaging suite equipped with Celesteion, Toshiba, Japan. A low-dose CT examination (midbrain to midthigh) from head to toe followed by acquisition of PET imaging using 3 min/bed position from toe to head in all patients. Follow-up scans were performed with the same protocols, keeping18 FDG dose, uptake time, and hepatic SUV mean of baseline and follow-up studies within ±10%, ±15%, and 20% minutes, respectively, as per published recommendations. Nodal mass ≥10 cm was considered as a bulky disease and splenomegaly when ≥13 cm. SUVmax were measured over the hottest tumor deposits in both scans and % change in the highest SUVmax of baseline and iPET studies (%△SUVmax) were also measured. Similarly, % change in size of the largest lesion (%△ size) in baseline and iPET scans were also measured. Comparisons between patient groups were performed using Student's t-test for continuous variables and the Chi-square test for categorical variables. Continuous variables were described by mean ± standard deviation. Multiple regression analysis was performed to calculate the area under the curve and odd ratios for age, gender, body mass index (BMI), baseline SUVmax, bulky disease, and baseline lesion size in lymphoma responders. Kaplan–Meier cumulative response for HL and NHL responders was performed, and curves were compared using the log-rank test. The median response for age, BMI, baseline SUVmax, and baseline largest lesion size was expressed with a corresponding 95% of confidence interval [CI]. Statistical significance was defined as a value of P < 0.05. Commercially, available packages Microsoft excel 2010, Medcalc,® and statistical package for social sciences (SPSS 19 (IBM Company, SPSS, Inc, USA)®) were used. During the study period, 97 of 112 consecutive patients (15 patients who did not have iPET were excluded) with lymphomas. Thirty-two patients (32/97) had HL while 65/97 had NHL. Mean age of total cohort was 45 ± 19 years (71% male and 29% female) having a mean BMI of 25.57 ± 5.54 Kg/m2 [Table 1]. Patients were categorized to have Stage I (21%), Stage II (18%), Stage III (16%), and Stage IV (45%) disease [Table 2]. Bulky disease was found in 14%, splenic involvement in 30%, hepatic in 09%, extralymphatic in 37%, and 33% had18 FDG-avid marrow deposits [Table 2]. Pulmonary nodules (both18 FDG avid and nonavid) were seen in 29% while pleural effusion and ascites were seen in 9% and 4%, respectively [Table 2]. %Δ changes in fasting blood sugar,18 FDG dose, uptake time, and liver SUVmean were 3.96%, 2.83%, 2.49%, and 12.15%, respectively [Table 1]. Based on Deauville's scoring, cohort was divided into responders having Score 1–3 (49/97); [Figure 1] and nonresponders having Score 4 and 5 (48/97; [Figure 2] and [Table 1]. Demographic analysis found no significant difference between responders and nonresponders for age, gender, BMI, staging, the presence of bulky disease or marrow involvement, and study protocol (baseline and iPET) [Table 1] and [Table 2]. No significant coefficient or odd ratios were found on multivariate analysis for age, gender, SUVmax, size, BMI, NHL, and advance disease (stage III and IV) in both groups (χ2: 5.12; receiver operating characteristic [95% CI]: 0.616 (0.51–0.713); P =0.528) [Table 3]. Among the responders, 18/49 had HL and 31/49 had NHL. HL responders were found to be significantly younger with significant fall in BMI on iPET as compared to NHL responders. Rest of the variables was found to be nonsignificant [Table 4]. 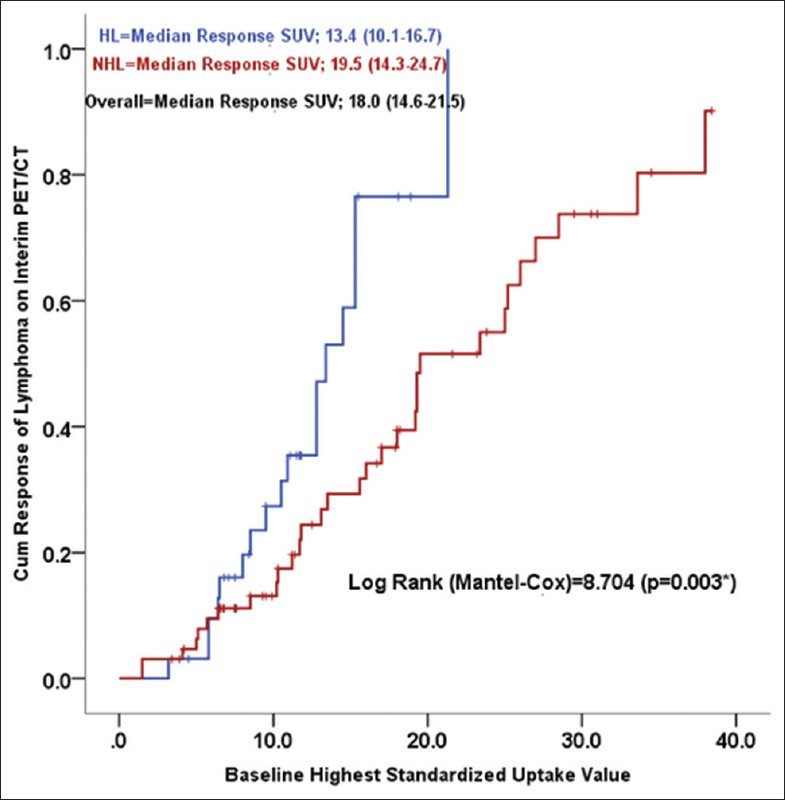 Among the responders, median SUVmax and size were significantly lower in HL as compared to NHL (SUVmax: 13.4 vs. 19.5 and size: 52 vs. 87 mm; P < 0.0001) [Figure 3] and [Figure 4]. 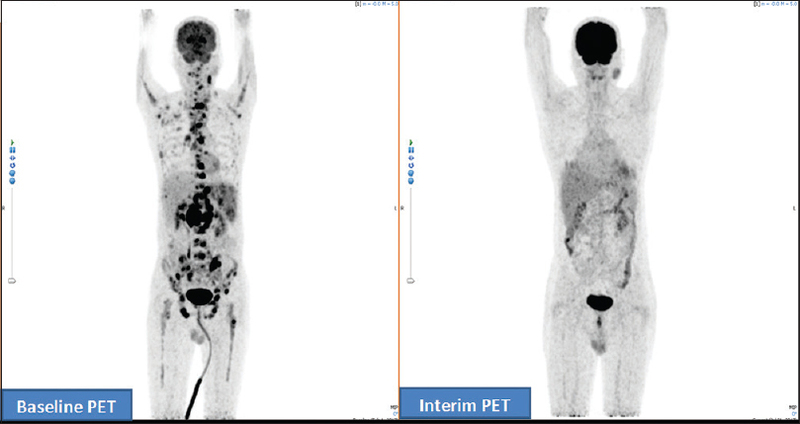 18 FDG PET/CT has revolutionized the management of lymphomas and considered as gold standard for accurate staging and response evaluation at the end of treatment. However, the role of interim18 FDG PET/CT (iPET) in response adaptation in lymphomas (especially in NHL) is under evaluation due to variable results observed in various trials. The basic reason is high false-positive rate ranging from 57% to 94% due to18 FDG uptake by posttherapy inflammatory tissue rather than viable tumor. Other possible reasons for variable results are heterogeneity in patients' population (age and gender predominance), nonstandardized imaging, and interpretation criteria used in different studies. In the present study, we studied the factors predicting the metabolic response on iPET scan. In this study, age was not found to have significant relation in responders and nonresponders which is in contradiction to published facts that age is considered as a negative predictor of response. BMI is considered as a better predictor of response and overall survival (OS) in patients with lymphoma. Our data did not show any impact of BMI in responders and nonresponders. This is in concordance with another published study which also failed to show the impact of BMI on metabolic response. Response rate (Deauville score 1–3 on iPET) was >50% in HL while <50% in NHL, but these were not statistically significant which could be attributed to small sample size. However, this response rate is almost similar to a recently published study having a response rate of 53% but significantly lower than another study having a response rate as high as 72%. Importantly, SUVmax and size of the largest lesion on baseline PET/CT did not show any significant difference between responders and nonresponders on iPET. Our findings are in concordance with another published study which did not find any significant correlation of baseline SUVmax with response on iPET. Univariate and multivariate analyses also failed to show any significant impact of age, gender, BMI, baseline SUVmax and lesion size, NHL, and advance disease on the metabolic response on iPET. These observations are surprising as most of the published studies did find the impact of these factors on PFS. However, we have investigated the impact of these factors on the metabolic response on iPET and not PFS or OS as data are being collected in studied cohort until writing this manuscript. We feel that large sample size studies with propensity-matched patients having18 FDG PET/CTs with standardized imaging and reporting protocols are deemed necessary to further explore this observation. We did not observe any significant difference of staging, extranodal involvement, bulky disease, and marrow involvement between responders and nonresponders. These observations are in contradiction to published findings revealing the poor impact of bulky disease, staging, and extranodal involvement on PFS. HL responders were found to be significantly younger with a higher decline in BMI as compared to NHL responders. This could be secondary to wider range of BMI at baseline in HL patients. This was also confirmed by no statistically significant difference on cumulative response by median BMI in both HL and NHL groups (P = 0.546). Another important observation in our study is that baseline SUVmax and tumor size among total cohort (more pronounced in NHL than HL) had a direct correlation with a metabolic response on iPET. This is in contradiction to the study by Mikhaeel et al., revealing negative impact of SUVmax and metabolically active tumor burden on PFS. However, in current study, we have studied the impact of metabolic response on iPET and we need longer follow-up to validate these findings for PFS. Our study has some limitations which need to be addressed in the future studies. First, the sample size is small which was due to strict inclusion criteria. We did not include those patients who had baseline PET/CT performed outside for the sake of maintaining standardization. Second, we did not validate nonresponders on iPET by biopsy to ascertain false-positive results. Third, we did not subgroup HL and NHL responders to see the response in early and advanced disease as it would further attenuate the sample size. Fourth, end point of our study is metabolic response on iPET rather than PFS which needs follow-up which is currently underway. We conclude that no significant predictor was found for response in propensity-matched patients with lymphomas (both HL and NHL) who had baseline and interim PET/CT acquired with a standardized protocol. 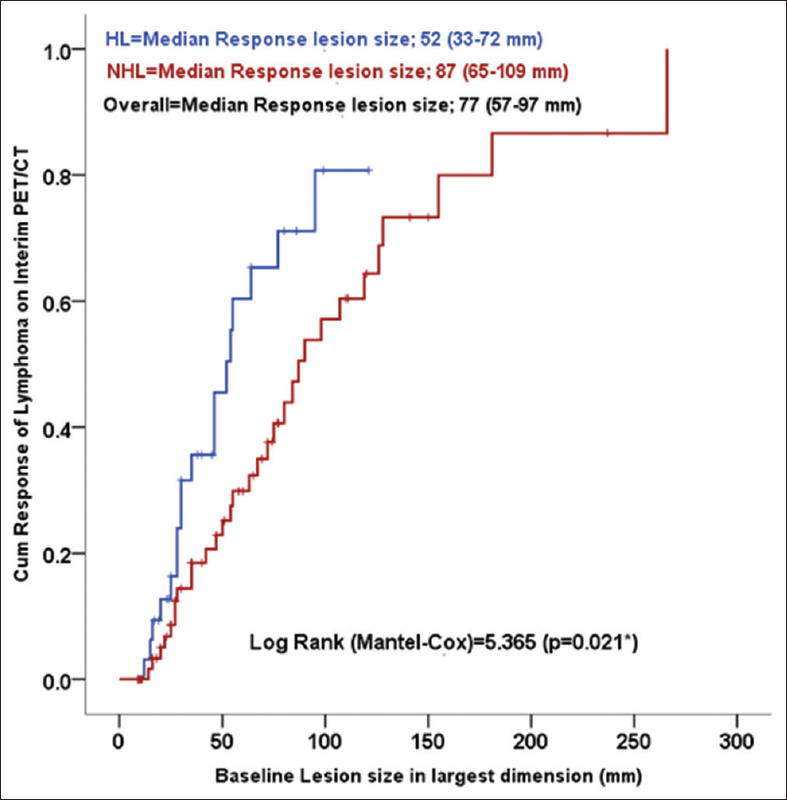 However, NHL responders were found to have higher baseline median SUVmax and larger lesion size as compared to HL responders. Although, these data are not in concordance with published findings but need to be validated with larger studies using standardized imaging and reporting protocols in propensity-matched patients with lymphomas. Kobe C, Dietlein M, Hellwig D. PET/CT for lymphoma post-therapy response assessment in Hodgkin lymphoma and diffuse large B-cell lymphoma. Semin Nucl Med 2018;48:28-36. Gallamini A, Zwarthoed C. Interim FDG-PET imaging in lymphoma. Semin Nucl Med 2018;48:17-27. Schillaci O. Use of dual-point fluorodeoxyglucose imaging to enhance sensitivity and specificity. Semin Nucl Med 2012;42:267-80. Lopci E, Toschi L, Grizzi F, Rahal D, Olivari L, Castino GF, et al. Correlation of metabolic information on FDG-PET with tissue expression of immune markers in patients with non-small cell lung cancer (NSCLC) who are candidates for upfront surgery. Eur J Nucl Med Mol Imaging 2016;43:1954-61. Meignan M, Gallamini A, Meignan M, Gallamini A, Haioun C. Report on the first international workshop on interim-PET-scan in lymphoma. Leuk Lymphoma 2009;50:1257-60. Boellaard R. Need for standardization of 18F-FDG PET/CT for treatment response assessments. J Nucl Med 2011;52 Suppl 2:93S-100S. Cheson BD. PET/CT in lymphoma: Current overview and future directions. Semin Nucl Med 2018;48:76-81. Barrington SF, Mikhaeel NG, Kostakoglu L, Meignan M, Hutchings M, Müeller SP, et al. Role of imaging in the staging and response assessment of lymphoma: Consensus of the international conference on malignant lymphomas imaging working group. J Clin Oncol 2014;32:3048-58. Cox MC, Ambrogi V, Lanni V, Cavalieri E, Pelliccia S, Scopinaro F, et al. Use of interim [18F] fluorodeoxyglucose-positron emission tomography is not justified in diffuse large B-cell lymphoma during first-line immunochemotherapy. Leuk Lymphoma 2012;53:263-9. Lazarovici J, Terroir M, Arfi-Rouche J, Michot JM, Mussot S, Florea V, et al. Poor predictive value of positive interim FDG-PET/CT in primary mediastinal large B-cell lymphoma. Eur J Nucl Med Mol Imaging 2017;44:2018-24. Adams HJA, Kwee TC. Interim FDG-PET in lymphoma, a questionable practice in hematology. Eur J Nucl Med Mol Imaging 2017;44:2014-7. Shi Z, Ding H, Shen QW, Lu XG, Chen JY, Chen X, et al. The clinical manifestation, survival outcome and predictive prognostic factors of 137 patients with primary gastrointestinal lymphoma (PGIL): Strobe compliant. Medicine (Baltimore) 2018;97:e9583. Weiss L, Melchardt T, Habringer S, Boekstegers A, Hufnagl C, Neureiter D, et al. Increased body mass index is associated with improved overall survival in diffuse large B-cell lymphoma. Ann Oncol 2014;25:171-6. Li T, Liu ZG, Liang PQ, Wang HT. Can body mass index predict the outcome of diffuse large B-cell lymphoma? A single-center retrospective study in China. Leuk Lymphoma 2017;58:1624-9. Park S, Moon SH, Park LC, Hwang DW, Ji JH, Maeng CH, et al. The impact of baseline and interim PET/CT parameters on clinical outcome in patients with diffuse large B cell lymphoma. Am J Hematol 2012;87:937-40. Mikhaeel NG, Smith D, Dunn JT, Phillips M, Møller H, Fields PA, et al. Combination of baseline metabolic tumour volume and early response on PET/CT improves progression-free survival prediction in DLBCL. Eur J Nucl Med Mol Imaging 2016;43:1209-19.